Give kids the confidence to create with the included coloring board and art supplies! 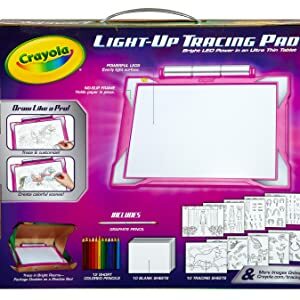 They can place any of the 10 tracing sheets on the Light Up Tracing Pad, then use a blank sheet and the graphite pencil to trace the image before adding their own flair. The art kit lets kids choose from over 100 traceable images, which helps guide their creativity without requiring them to draw an individual scene from scratch. The 12 short colored pencils make coloring and embellishing the traced design smooth and easy. Drawing in the dark brings a new element to their artistry. The LED drawing tablet illuminates the tracing sheets so kids can be imaginative at night or in daylight. Plus, the glow in the dark fun gives kids the freedom to express themselves in an inventive way at home and on the go! 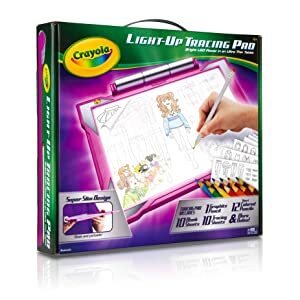 The pink Light up Tracing Pad makes a great girls’ present for birthdays or holidays. 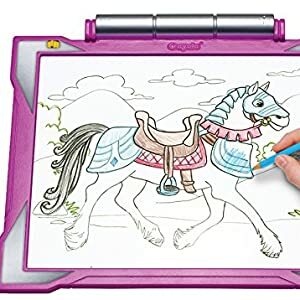 This gift for girls has horse and fashion show pictures to trace, plus there are more templates online that can be downloaded for free. They’ll love drawing, coloring, shading, and adding fine details to their mini masterpieces! Wrap up a pink activity pad for a special occasion and delight a little lady with a sleek tablet design made especially for her. The Light-Up Tracing Pad lets kids trace and color detailed scenes. The ultra-thin tablet design and bright LED drawing surface make tracing easy. Start tracing right away with the content inside, then download 100s of images online.